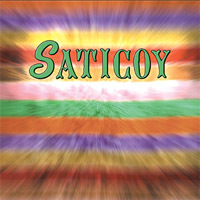 Saticoy's self-titled album features 12 tracks that span the early days of Charmed to the beginnings of Saticoy. You can buy the CD online by clicking here. All lo-fi wav clips at saticoymusic.com are created using special home-made family recipes that reproduce with stunning realism the vintage experience of listening to AM radio on a hot overcast day while driving with rolled-down windows through a valley. All Amazon.com mp3s are full-length songs encoded from the album master. We do not know if anyone noted the encoding bitrate used.